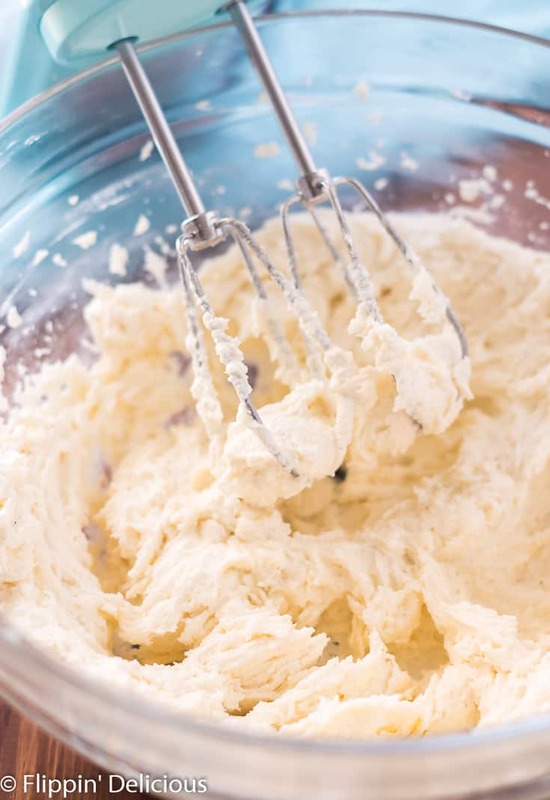 Vegan Buttercream Frosting- sweet, fluffy, and perfectly pipe-able, this dairy free buttercream frosting is my go-to for topping cookies and cakes. It makes a mean cupcake, too. I remember the moment I nailed my easy American buttercream frosting. Fluffy, and hitting the perfect “sweet-but-not-too-sweet” balance, it was perfection. Of course, then I had to figure it out all over again when our family went dairy-free. My youngest daughter doesn’t handle dairy well so our family is mostly dairy free. We still keep cheese on hand, and I won’t ever give up on my cream cheese frosting, but most of our meals and most things I bake are dairy free (and of course 100% gluten free). My perfect buttercream needed a dairy free makeover. This is it. 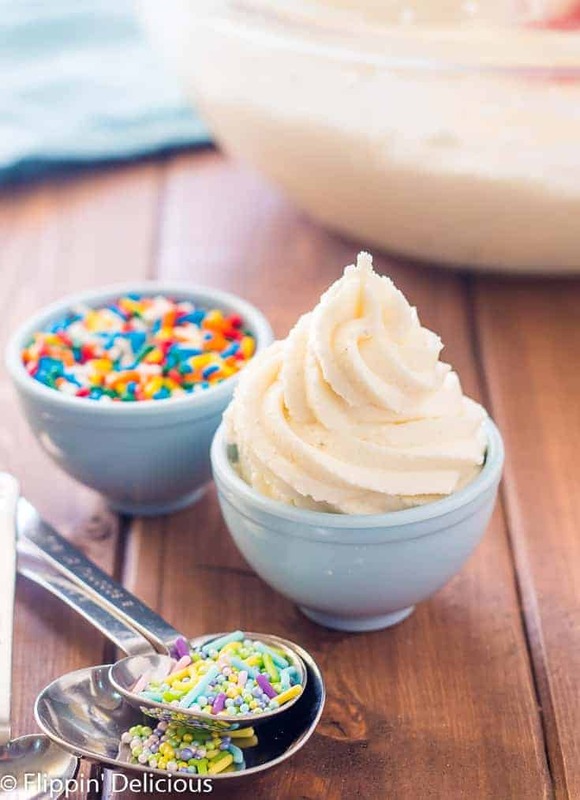 A perfectly pipeable vegan buttercream frosting. I’ve played with fat to sugar ratios. I’ve played with how much milk to add, if any. I’m pretty happy with my vegan frosting. I put it on everything. Well, not actually everything. I’d be silly to put buttercream on, say, gluten free enchiladas. However, I do put this vegan buttercream frosting on all my desserts. This vegan buttercream is the solution to all of my frosting needs. Use half vegan butter and half palm shortening. Frosting made entirely with vegan butter tends to be oily and greasy, in my opinion. Buttercream made with all palm shortening tastes like shortening. Not good. It is also too thick, and tends to look separated if you try and add any vanilla or milk. The solution is to use half vegan butter and half palm shortening. The resulting frosting has a good balance of texture and flavor. My go-to vegan butter is Earth Balance, but I’ve also used MELT or even Smart Balance in a pinch. Whip it. Whip it real good. No, I’m not joking. I whip the palm shortening and vegan butter for a solid 5 minutes. You can’t easily incorporate air into your frosting after you add powdered sugar (it is too thick) so you have to do it before. After I add the powdered sugar, I whip it again for at least 3 minutes to maximize the fluffiness. As Ina would say. I like to use vanilla paste in my frosting because it adds delightful vanilla specks. Also, vanilla paste is thickened/emulsified with xanthan gum so it helps to prevent my frosting having a separated “weeping” look. All the flavor in your frosting comes from the vanilla (since you have no butter) so it isn’t where I like to skimp. A little dairy free milk goes a long way. Add your dairy free milk slowly, and a little at a time. 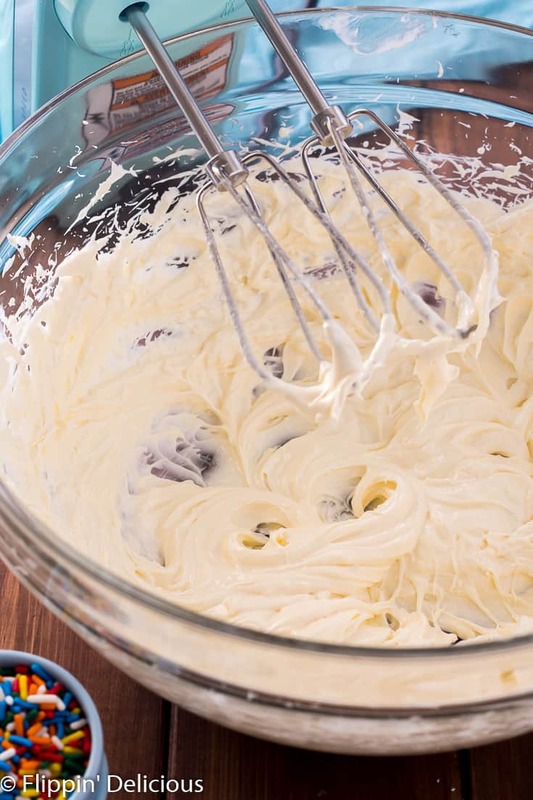 Vegan buttercream frosting can quickly separate if you add too much dairy free milk. This is because there isn’t any moisture in the palm shortening. Using half vegan butter helps with this problem, but you still want to be careful because it is less forgiving than traditional American buttercream frosting. You don’t want to skip over the dairy free milk though, your frosting will be too thick unless it is a hot summer day (if it is a hot summer day and your frosting seems smooth enough, use your judgement and skip the dairy free milk). 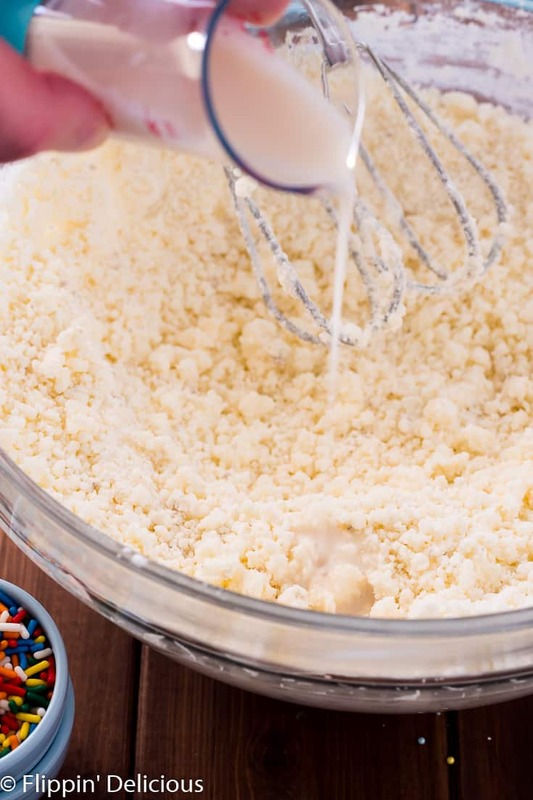 Add a teaspoon of milk, and then add more ½ a teaspoon at a time until your frosting is smooth and spreadable. And add the milk after the vanilla, since that will add more moisture to your frosting. If you accidentally add too much milk (it happens to the best of us) and your frosting is sloppy, too loose, or weeping, try adding ¼- ½ cup more of powdered sugar. This can sometimes help to absorb the extra liquid and save the day. Can you freeze vegan frosting for later? Yes, you can freeze your vegan frosting for later. You can also store it in the fridge. Place your frosting in an airtight container or freezer bag, and remove excess air if possible. 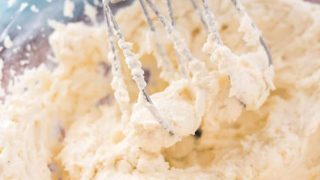 You can freeze your vegan buttercream for up to 3 months, or store in the fridge for up to a week. To use your frozen vegan frosting, let it come to room temperature and then whip for a minute or two, until it is light and fluffy. It may take a few hours for it to thaw to room temperature, so plan for that. If you try to speed up the process in the microwave you are likely to melt your frosting! Does vegan frosting set up like a normal buttercream? Yes, my vegan frosting sets up like a normal buttercream. It actually travels better than a frosting made with all butter because the palm shortening isn’t as temperature sensitive. Do I need to refrigerate cake frosted with vegan buttercream? From a food-safety perspective, you should still refrigerate anything frosted with vegan frosting. It doesn’t have butter, but the dairy free milk and vegan butter should still be refrigerated if you are storing it long-term. Personally, if I’m frosting something and I’ll be using it within a day or two I don’t worry about refrigerating it. I haven’t had any problems. If you are storing long term, I suggest refrigerating or freezing anything frosted with vegan buttercream. It all comes down to a judgement call, juggling the food safety aspect vs. the convenience and texture of keeping the vegan frosting at room temperature. If refrigerated, it will harden and you will have to wait for it to come back to room temperature, which can take several hours. Armed with my not-so-secret-anymore tips, make some vegan buttercream frosting! 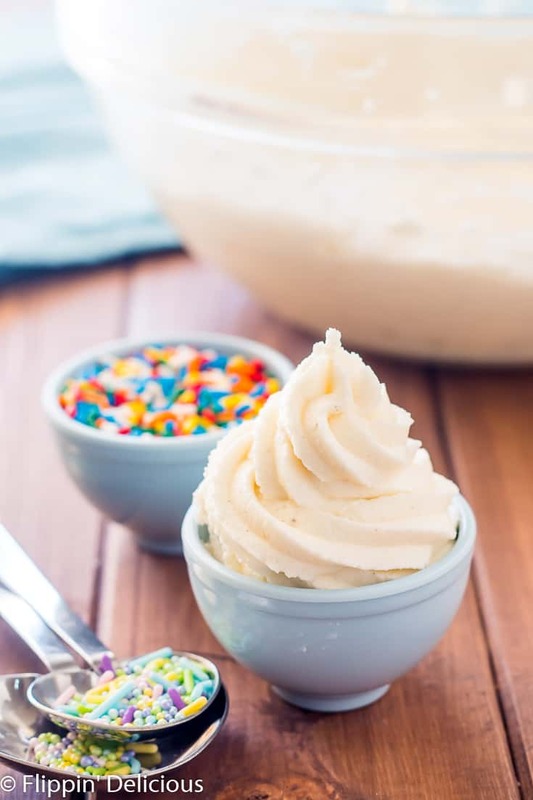 Vegan Buttercream Frosting- sweet, fluffy, and perfectly pipeable, this dairy free buttercream frosting is my go-to for topping cookies and cakes. It makes a mean cupcake, too. Whip the palm shortening and vegan butter using a stand mixer or heavy duty hand-held mixer for 5 minutes. Set a timer! It should be light in color, and very fluffy. Add the powdered sugar, and vanilla extract. Beat at a low speed to combine. 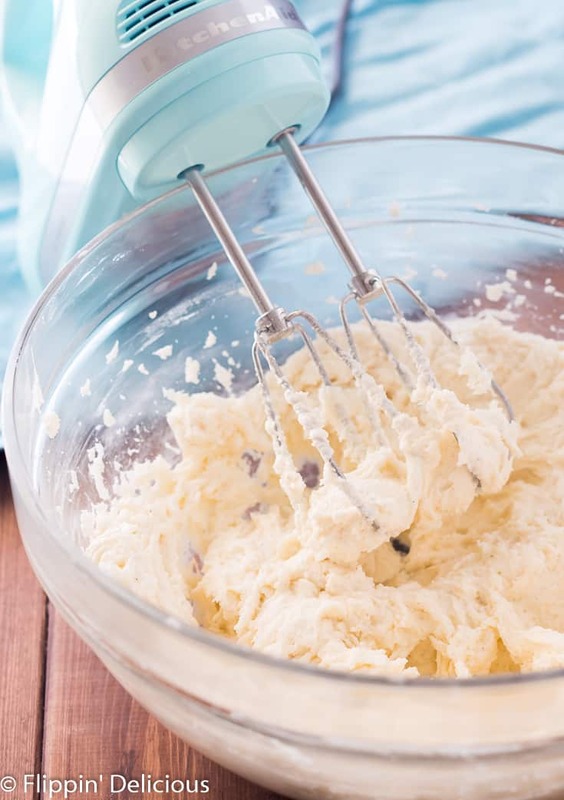 Add the dairy-free milk a teaspoon at a time, while whipping, until the frosting comes together. If the frosting is still too thick add a little dairy free milk. Add a teaspoon of milk, and then add more ½ a teaspoon at a time until your frosting is smooth and spreadable. And add the milk after the vanilla, since that will add more moisture to your frosting. 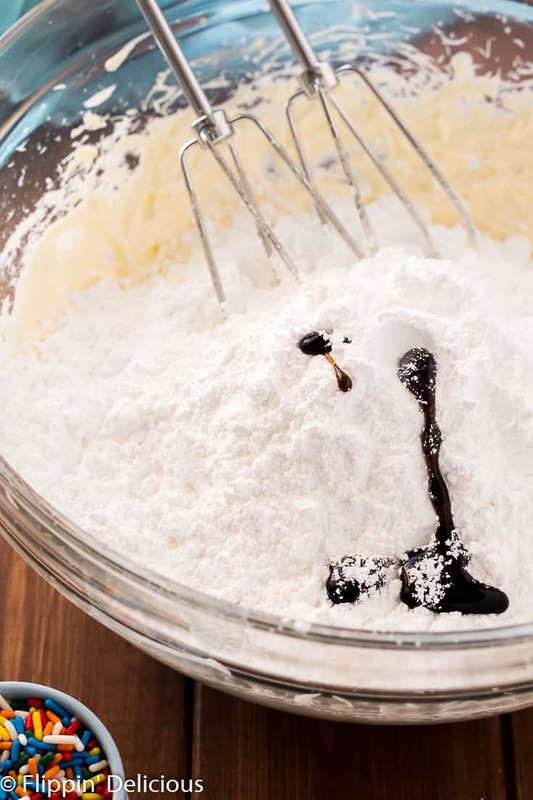 If you accidentally add too much milk (it happens to the best of us) and your frosting is sloppy, too loose, or weeping, try adding ¼- ½ cup more of powdered sugar. This can sometimes help to absorb the extra liquid and save the day. Increase the speed and whip for another 2-3 minutes or until light and fluffy. You can easily half this recipe, or even make only a quarter batch. Perfect timing for this recipe given the royal wedding this weekend! Looks great! Do you have a recipe for a birthday cake my kid is allergic to dairy, nuts 🥜 gluten, eggs 🥚 milk 🥛 please help he will be 8 years old in December and has never had a birthday 🎂 cake. Happy birthday to your kiddo! I’ve made several of the recipes on my website with an egg replacer and have had great results. I would suggest my homemade gluten free cake mix, gluten free rainbow cake, gluten free rainbow cupcakes, and gluten free red velvet cake (or gluten free red velvet cupcakes). I’ve tested some of them with a flax egg (1 tablespoon ground flax meal + 3 tablespoons warm water) or Bob’s Red Mill’s egg replacer. The flax egg would work better in the red velvet cake because the color will hide the flax meal speckles. I think all of those recipes have dairy free substitutions noted, but if any don’t please let me know. 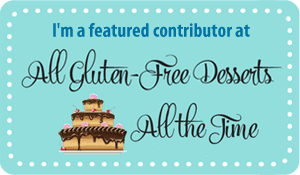 I bake dairy free for my family now, my toddler has a dairy intolerance. Can you use coconut milk or is that too thin? Hi Chantal, You can use coconut milk or any dairy free milk as the milk in this recipe. If it is a thicker canned coconut milk, you may actually need more. That is why I did a range of 1-2 tablespoons, depending on the milk you need (and also things like the humidity or how warm it is) you may need a little more or less dairy free milk. Hope that helps answer your question! Palm oil comes from PALM TREES, which have to be cut down, which CAUSES DEFORESTATION, which has made certain species of animals, like orangutans and sumatran tigers to become CRITICALLY ENDANGERED! Which is a REAL thing! I agree with you, it is important to take care of our earth. I am careful to only use sustainable palm oil products, and sustainable palm shortening. 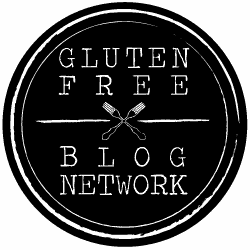 My friend Erica from Celiac & the Beast wrote an article about how to find responsibly and sustainable sources palm oil products which you may find helpful. I am careful to only purchase sustainable palm shortening, because I love our planet. If you’d prefer, you can use another shortening too. Is there a way to cover up the powder sugar taste of the frosting ? It almost spreads like icing. Using a good vanilla extract makes a big difference. The vanilla extract is where almost all the flavor comes from. I like using Rodelle Vanilla, but any pure vanilla extract will work. Don’t skimp on the cheap stuff! (And make sure you add enough.) I love using vanilla paste because it adds vanilla bean specks to the frosting, and in my experience has more flavor without worrying about the taste of alcohol coming through. This was delicious! Non dairy and gluten people at the party couldn’t even tell the difference! Thanks so much for this recipe! I am wanting to make this chocolate. I am assuming I could just add cocoa but I didn’t know how much and if I need to change the palm shortning and butter amounts? Thanks! I’m so happy you (and everyone else) enjoyed it! Thank you for the reminder that I need to publish my chocolate version. I normally add a few tablespoons of cocoa powder and about 1/4 cup (or more) of vegan melted (AND COOLED) chocolate to the frosting after it is finished and beat it until it is combined. No need to change the palm shortening or butter amounts. Thanks so much for the reply! I ended up just playing with it because I needed a dairy and gluten free chocolate buttercream quickly and it was delicious! So glad I have found a vanilla and chocolate buttercream that I am pretty sure I am going to put on everything. Lol Thanks so much for sharing your recipes! So happy it turned out! Having a good and safe frosting is such a great tool. I put them on everything, too! I am always looking for more vegan frostings. I love to make cake and cupcakes and like to play with the frostings. Thank you, Kathy. No one should miss out on Frosting. Does this frosting st up at all like normal buttercream? I need a frosting that will set up and not slide at all. Hi Rebecca, Yes that frosting sets up like normal buttercream. Be careful when adding the dairy free milk to not add too much. Even a little too much can make the frosting sloppy. Thank you so much for the reply. I was also curious if you are able to use different kinds of shortening with the same effect. How long can this frosting sit out? I am making a cake for a customer and i am adding fresh strawberry slices inside the layers and im wondering if i should refirherate he wntire time? I hate refrigerarinf cakes because the frosting and cake gets so hard! Food safety is a tricky thing, especially if making the cake for someone else I’d recommend refrigerating it if it will be out for more than 4 hours. Instead of using vanilla could I use almond extract? I have to make a dairy free wedding cake for my niece and she wanted the almond flavoring instead…… thank you so much for your recipe!! Absolutely! You can flavor your vegan frosting with any extracts. Good luck on the wedding cake! Can this be frozen or refrigerated and used within a week or 2? Wasnt sure if it could be brought up a little in temperature, beat for a few minutes and then put on the cake. I am making (and freezing) a cake for a party.. need to make frosting ahead of time. Absolutely! I have made this frosting and store it in the fridge for up to a week, and in the freezer for up to three months! Just thaw at room temperature, and give it a quick whip. What brand of palm shortening do you use? I normally use Spectrum or Nutiva palm shortening. Any non-hydrogenated palm shortening will work fine, try to avoid ones that have any ingredients other than palm oil. I try to find ones that are sustainably sourced, and last I checked Spectrum and Nutiva both were.